Only 244 Hours On The Single Yanmar 6 Cylinder Common Rail Diesel.Bow And Stern Thrusters. 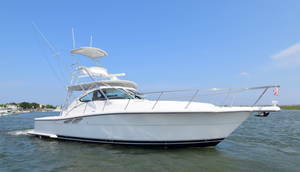 Complete Raymarine Electronics Package. Vessel Shows Like New And Is Immediatly Available. Offered at $295,000 With Replacement Over $430,000. Beautiful Down East Style Powered With Cummins 480 HP Single Diesel,September 2018 Awlgrip Flag Blue Hull Painting, Engine Cooling System Service And Bottom Painting. Maine Built With The Most Modern Construction Techniques. Fast, Efficient And Beautiful. Loaded With Almost Every Option And Ready to Cruise Away. Offered At $389,500. 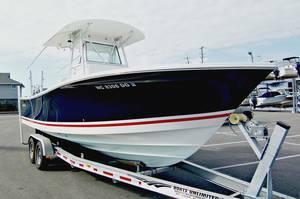 Loaded With Options And Ready To Fish Or Cruise, Helm And Cabin Air, Refrigerated Fish And Drink Boxes, Bow Thruster, Diesel Generator And Low Hours On Yamaha Outboard Power. Offered At $234,500. 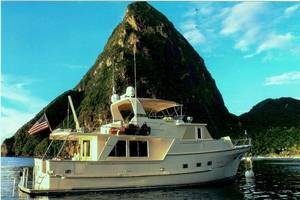 Cruise 8 or 16 knots with this 2 state room, 1 head vessel. 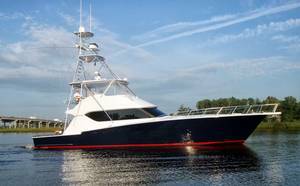 Lower and upper helm stations, bow and stern thrusters and limited amount of exterior wood with fiberglass decks and swim platform. Ready for the next owner having just returned from wintering in Florida. Offered at $274,900. Only 118 Hours on the single Yanmar 370 HP common rail diesel. Generator and air in cabin and at helm deck. Bow and stern thrusters make for easy docking. Like new and a good value. Offered at $315,000. The prefered Caterpillar 3412 E 1400 HP Diesels power, spacious interior with Cherry wood paneling. A great value. Offered at $395,000. 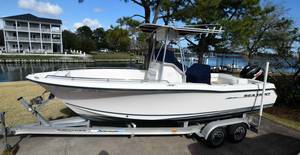 Twin 150 Yamaha 4 Stroke Outboards With Less than 500 Hours. 2018/19 Updates Include New Tubes, Complete Motor Service, New Helm Deck Upholstery. Trailer Included And With Tubes Deflated width Is Less Than 8' 6" Which Means No Need For Oversize Permit To Tow. 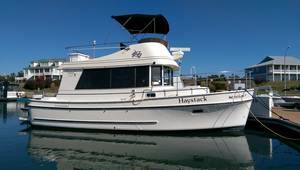 Built In New Zealand By Rayglass/Protector To Ride Smooth, Handle Well And Stay Dry In Rough Seas With Solid Fiberglass Deep V Hull. Tow Bit Aft And Cabin With 2 Berths And Electric Head. Offered at $119,000. Twin Cummins 480 HP Diesels, Beautiful Teak And Holly Flooring. 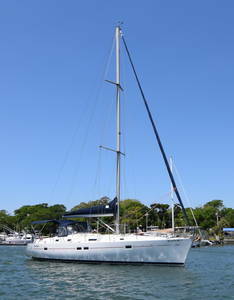 Many Recent Updates And Seriously For Sale As owners Are Taking A Break From Boating To Travel The World. Offered At $195,000. Cat 3208 375 HP Diesels with 1,563 hours as of April 2018. 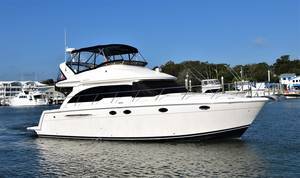 2 State room, 2 head layout with nice aft deck and cockpit for easy boarding and access to the water. Updated electronics and offered at $109,000. Twin Cummins Diesels, 2 State Room, 2 Head Layout. 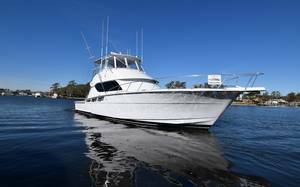 Upper And Lower Helm Stations, Walk Around Side Deck, Huge Cockpit, Shallow Draft And Economical Operation At Displacement Speeds Or At 16 Knot Cruise And Plenty Of Range With 700 Gallon Fuel Capacity. Offered At $265,000. 5 Stateroom layout plus bonus 6th stateroom for additional crew. 16V2000 MTU 2600 HP with extended warranty into 2019. Fully outfitted with the finest electronics, audio and communication systems. Immediately available. Offered at $5,725,000 replacement 8.5 Million. Three State Room With King Master And Pedestal Queen VIP Cabin Forward. 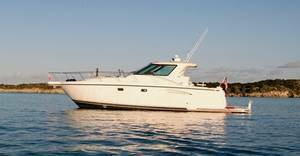 Shallow Draft With Prop Pockets,Low Hours On Cat C 30 1,550 HP Diesels. 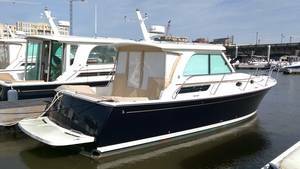 Water Maker, Teak Cockpit And Covering Boards, Classic Look With Fresh Navy Exterior Hull Paint. Vessel Is Sharp And Is In Turn Key Condition. 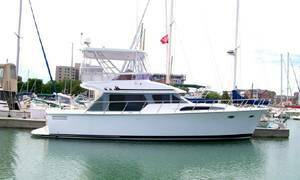 One Of The Nicest Hatteras 60's I have Seen With Many Updates. She Will Impress The Most Discriminating Buyer.Offered At $795,000. Custom Ice Blue Painted Hull, Tri Axle Aluminum Bunk Trailer, 694 Hours On Yamaha 350 4 Stroke With Recent Service. An Excellent Value, Offered At $59,900. Twin 250 HP Yamaha 4 Stroke Outboards With 703 Hours As Of August 2018. Dry Stack Stored, Well Above Average. No Trailer, Has White Bottom Paint.Offered At $95,000. Powered with Cummins 540 HP QSC Common Rail Diesels. Beautiful fresh water vessel. Single Diesel With Bow And Stern Thrusters. Great Economy, Fast Or Slow. 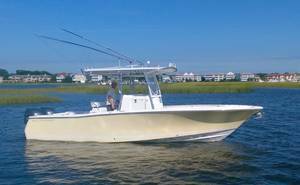 250 Yamaha 4 Strokes With 400 Hours, Clean And Well Optioned This Air Conditioned Cruising Or Fishing Platform Does It All. Just Serviced And Spring Wax Completed. Above Average And A Good Value. Offered At $89,000. 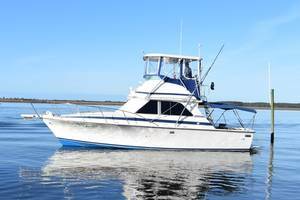 Look no further if you want a very clean well maintained quality cruising or fishing vessel. 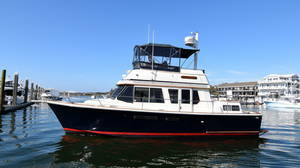 The helm deck is air conditioned and heated making for an upper salon to enjoy the water views. Generous accommodations below with stall shower head and queen pedestal berth. A great value and very clean, offered at $179,000. Repowered with Cummins 6BT 330 HP Diesels and a new Westerbeke 5 KW generator this is a special classic Bertram for sale by the type owner everyone wants to buy from. 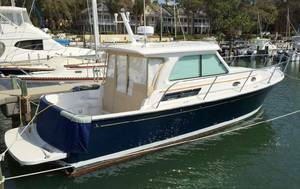 New Strata Glass flybridge enclosure, LED lighting, bottom painting and engine maintenance she is ready to go. A great value at $79,000. 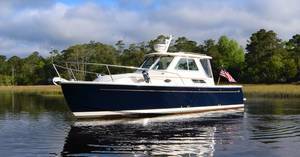 Beautiful painted hull and only 342 hours on the single Yanmar 380 HP 6 cylinder. 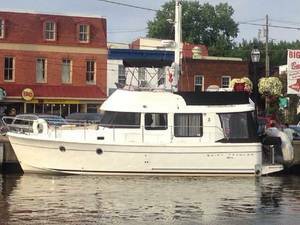 "Barbara Ann" is loaded with Generator, bow and stern thrusters, air conditioning in the cabin and at the helm. Most electronics new in 2015. A great value at $139,500. 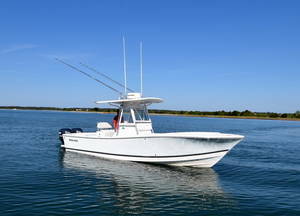 Twin Crusader 8.1L 385 HP Fresh water cooled inboard gas power. 5 KW generator, cabin air and heat as well as cool air helm vent. 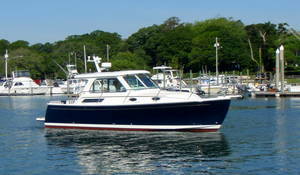 Great all around vessel with low maintenance exterior. Solid Teak and Holly flooring, Garmin electronics. Offered at $120,000. New Cummins QSB common rail diesels with warranty to March 2017. Stabilizers and bow thruster with wide walk around side decks for comfort and ease of docking.Compare to Fleming and Selene and you will see what a value "Panache" is. Ready to cruise in comfort. Offered at $535,000. 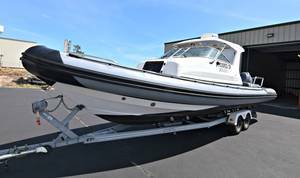 Three Yamaha 300 HP 4 Strokes With only 67 Hours.6 Year Yamaha Warranty And Basically A New Boat Available Due To Owners Change Of Plans. 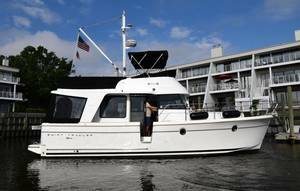 Diesel Generator, Helm Deck Air Conditioning, Beautiful Cashmere Hull Color And Cabernet Boot Stripe.$570,000 List price, Offered At $469,000..
Loaded with all the best options and recently traded for a 37' Back Cove. Volvo D 6 370 HP single diesel, 4 KW Fischer Panda diesel generator, 2 air conditioning units, full Garmin electronics package and very low hours. Hull was painted midnight blue Awlgrip. A great value offered at $310,000. Twin Cummins QSC 8.3 Ltr Common Rail Diesels give a fast economical cruise with dependability. Although rigged so that you can fish vessel was cruised by her original owners.Teak and Holly floors, Corian countertops. Must see and seriously for sale. A great value , offered at $285,000. 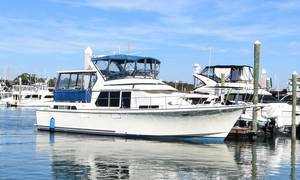 Every Option You Could Want With Bow And Stern Thrusters, 2 Generators, Water Maker, Air Conditioned Fly Bridge And Engine Room. Dependable Cummins QSM 11's. Offered At $615,000. 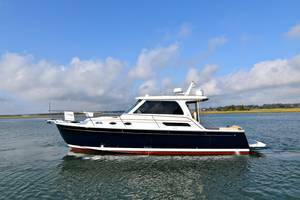 Tom Fexas West Coast Designed Sedan Bridge With Extended Hardtop Over Aft Deck Area. 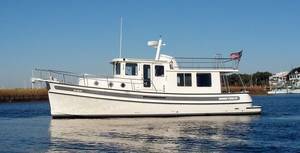 Two State Rooms, Galley Up, Fiberglass Stairway To Fully Air Conditioned Flying Bridge.Dependable Cummins Electronically Controlled Diesels Provide Excellent Economy And Long Range While Still Giving Flexibility To Cruise In The High Teens. 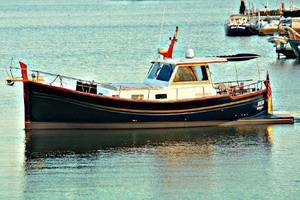 Bow Thruster, Excellent Electronics and Very Active Owner Who Has An Eye For Detail. 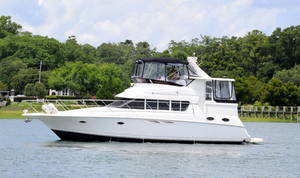 Shallow Draft And Low Maintenance Exterior Give More Access And Time For Exploring And Relaxing. Vessel Is In Excellent Condition And Is Ready To Cruise Away. Offered At $299,000. Pleasing Exterior Profile Attracts Your Eye To "Safari". 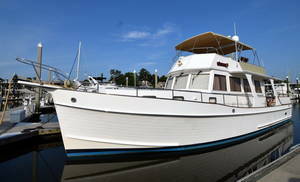 Closer Inspection Reveals A Classic Day Boat In Top Condition Ready To Enjoy By The Next Owners. 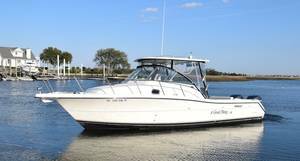 No Need To Spend Your Time "Getting Her Right" She Is Waiting For You Today.Shallow Draft And Jet Drive Propulsion Allow Worry Free Shallow Water Exploration. Jet Stick Docking System Makes Approaching And Leaving The Dock Easy. Offered At $159,000. Twin Cummins 450's With Low Hours. Factory 4' Extension Provides A Huge Aft Deck. Two Sate Room Two Full Heads With Galley Up. Numerous Upgrades Make This A Great Value. Offered At $430,000. Only 615 hours on Twin Yamaha 225 Four Strokes. One owner, no bottom paint, stored on a lift. Electric head in console, great sea boat! Forward seating and trailer. Offered at $65,000. Only 762 Hours on single Volvo 200 HP Diesel as of June 2016. Bow thruster, air conditioning, generator and teak and holly flooring. Original owners have taken excellent care of her. 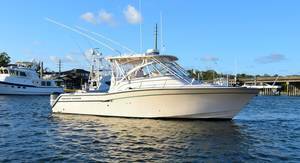 Huge flybridge for entertaining with upper and lower stations for all weather boating. Offered at $114,000. 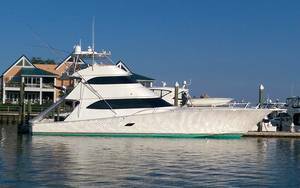 In excellent condition and with loads of quality options, "Just Us" has just had it's spring maintenance completed and is ready to cruise. Owners have their new boat in sight so hurry! Offered at $109,000. 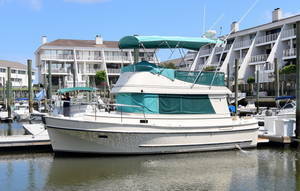 Spacious 2 state room 2 head interior with dinette adjacent galley. 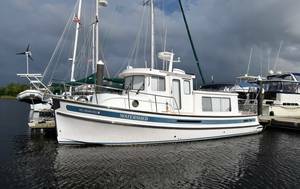 Great live aboard and above average condition. Many updates in 2016 including new canvas and bottom paint. Offered at $89,000. 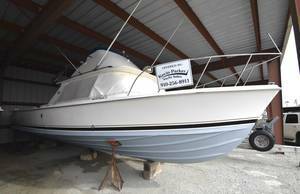 Has the forward seating, Yamaha 225 4 strokes with exhaust tuner updates, factory fiberglass hardtop, never been bottom painted, is in excellent condition and comes with tandem trailer. Offered at $79,000..
Beautiful 2 state room 2 head layout. 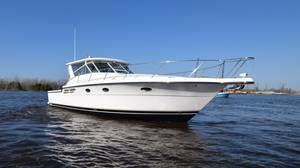 Twin Volvo 430 Hp Diesels,bow thruster, Air conditioned helm deck, washer dryer, excellent electronics and priced to sell. Many recent updates add value. Offered at $169,000. Quality Fiberglass Construction With A Minimum Of Exterior Wood. Two State Rooms, Two Heads. 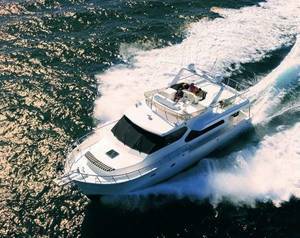 Cruise 16 Knots or Extended Range With 700 Gallons At Trawler Speeds. Fiberglass Stairway To Flybridge And Easy Boarding Through Transom Door In Cockpit. A Must See In Excellent Condition! Offered At $287,000. Beautiful Single Diesel, Down East Cruiser With Low Hours (675 April 2015). Fresh Hull Paint And Many Upgrades In 2014/15. Economical Operation With Single Cummins QSB 425 Hp Common Rail Electronic Diesel. 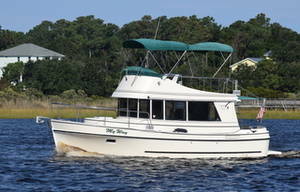 Bow And Stern Thrusters, Generator, 2 Air conditioners And Complete Electronics Including Sat TV. 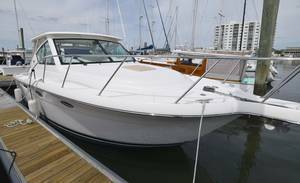 Very Clean And Updated, Ready To Cruise With Pride Of Ownership And An Excellent Value. Offered At $249,900. Great visibility from lower helm station and easy access to wide walk around side decks through adjacent side deck door. 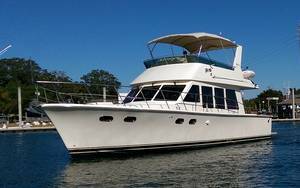 2 State Room, 2 head, galley up layout with spacious cockpit for entertaining or just enjoying sitting outside under cover enjoying the beautiful views. Spent the first ten years in fresh water and lightly cruised, she is way above average and powered with economical Cummins Diesels with only 763 hours. A must see and an excellent value at $225,000. Single 370 HP Volvo D-6 Electronic Common Rail Diesel, 25 Knots cruise and 1.6 MPG. Diesel generator, helm and cabin air. Fully equipped with quality options , recently serviced and comes with transferable extended warranty. 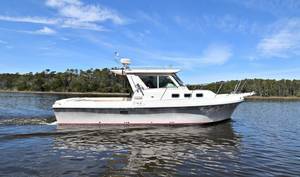 Shallow Draft, No Exterior Wood,Excellent Economy And Enough Speed To Catch A Bridge Or Out Run A Storm.Bow Thruster, Air Conditioning And Engine Driven Generator. Cleanest Engine Room Around! Offered At $74,000. High Quality Spanish Built Traditional Vessel. 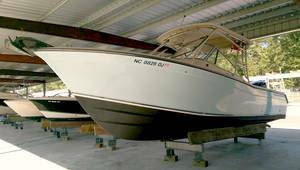 Twin Volvo Power, Full Keel, Bow Thruster And Solid Fiberglasss Construction. 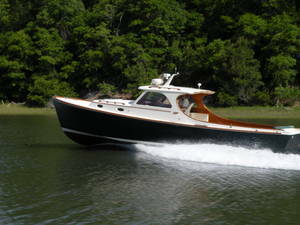 Shoal Draft Performance Cruiser In Turn Key Condition. 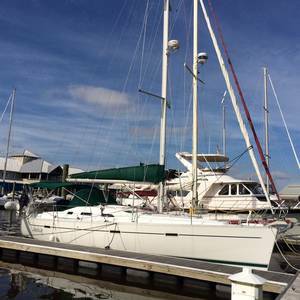 features Include 2 Air Conditioning Units, Upgraded Yanmar 54' HP Main, Solar Pannels Custom Mounted, Complete Electronics, New Main Sail And 140 Genoa From Neil Pryde Still In The Packaging! Nice Two State Room Two Head Layout With Lots Of Storage.This Is The Best Value In A 393 Beneteau And Ready To Cruise Now. Offered At $112,500. Three cabin, two head layout with air conditioning. Yanmar 50 Hp Diesel, Faux teak in cockpit for lower maintenance. 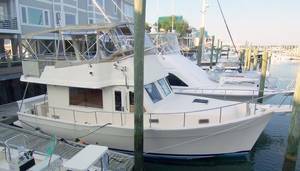 Great cruising sailboat with low maintenance exterior.New Bimini and enclosure 2015, Bottom painted in February 2016. offered at $92,000. Twin Yamaha 150 HP four stroke outboards with 545 hours as of May 2016. Recent curtains, interior cushions look new. Radar, autopilot, color sounder and more. A good value, reduced to $63,000. Beautiful Fresh Water Tug Recently Relocated To East Coast. Only 505 Hours On The Single Cummins 330 HP Diesel. Fully Outfitted And In Incredible Condition. Offered At $283,000.